Dental Implants make it possible to replace missing teeth with artificial teeth that look, act and feel like the real thing. Best of all, they are permanent. Dr. Mendelsohn and Dr. Zhang are both Fellows in the International Congress of Oral Implantology. Schedule an appointment with Mainland Dental Associates if you are from Pleasantville, Egg Harbor Township, Galloway, Linwood, or Mays Landing, NJ to discuss whether you are a candidate. Artificial teeth designed to replace missing teeth, made of an artificial tooth root and a dental crown. Implants can be used to replace one or more missing teeth and can also support for bridges and partial or full dentures. They are aesthetically pleasing, comfortable and fully functional. 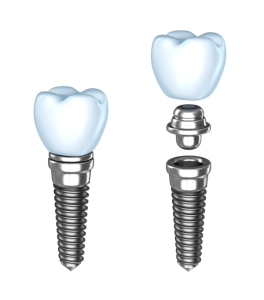 Learn more: What are Dental Implants? Why are implants an improvement over traditional dentistry? Dentures can still have their place but some patients experience slippage and maintenance problems with dentures. This won’t happen with implants because they are permanent and act like your own teeth. Custom fitted, they become a part of your mouth. The procedure generally involves placing a thin anchor attached to the jaw below the gum line. In a few months, the anchor fuses to the jawbone. Once this happens, a custom made dental crown is affixed to the anchor, creating a natural feeling and natural looking tooth. If you have missing teeth, you may be a candidate. However, since oral surgery is involved, you must have an adequate bone density in your jaw as well as healthy gums. A consultation will allow Dr. Mendelsohn or Dr. Zhang to make an assessment to determine whether you are a candidate or, if you are not, to recommend a number of perfect alternatives for you. Dental implants can help with a number of conditions and circumstances that have resulted in missing teeth. If you have lost teeth due to extensive damage or decay and are not experiencing other oral health problems, such as gum disease, you could be a good candidate for treatment with dental implants. Learn more: Are you a Candidate? What Types of Dental Implants Are Right for Me? Dr. Mendelsohn or Dr. Zhang can strategically place dental implants at their Pleasantville office to replace one, several, or an entire upper or lower row of missing teeth. For people with a few gaps in their smile, single dental implants can fill in these holes and create a complete smile, with beautiful results. The titanium rod of a dental implant is placed in the bone of your jaw and allowed to osseointegrate, or fuse with the bone, to nurture bone density and allow the implant to be a stable and permanent method for replacing teeth. For patients with groups of multiple missing teeth, dental implants can also act as anchors for an artificial set of teeth. Your dentures will snap onto these anchors and remain secure, restoring the full power of your bite. You can avoid the mess and hassle of removable dentures by securing your full-arch teeth replacements with dental implants. What Are Some Alternatives to Dental Implants? How Do They Compare? Dentures, either full or partial. While these options may be right for some patients, dental implants can, in many cases, prove a better method. While bridges and dentures replace the teeth, they do not encourage jaw bone growth as dental implants do. When you lose teeth, the jawbone begins to diminish from lack of stimulation from your natural tooth root. Depleted bone in your jaw can change the appearance of your face as well as cause your remaining teeth to shift. While patients can experience some post-implantation soreness and may need to eat soft foods for one to two days, they can typically return to work or school almost immediately after implantation. For more information about how you permanently restore missing teeth with dental implants in Pleasantville, contact Mainland Dental Associates today. Dr. Mendelsohn happily treats patients from nearby areas such as Egg Harbor Township, Galloway, Linwood, and Mays Landing, NJ.